The idea was to give community groups and professional bodies a warm and humane place in the heart of the city. Not only would every organisation from Greenpeace and Friends of the Earth to the Institute of Architects and the Peace Foundation have the opportunity to interact with the citizens of Auckland. They would also have the chance of interacting with each other to stimulate creativity and encourage co-operation. On the big issues of the day, such as climate change, each group would be able to have their own style while also benefiting from knowing what everyone else was doing. The Institute of Architects, for example, would have constantly changing exhibitions and displays and a good bookshop. The cluster of houses would provide a first point of contact for locals and tourists alike informing them about built-environment options. Lectures and meetings would be within easy walking distance of both students at adjacent campuses and the offices of the decision makers. It would be a living urban design example of the very reason why we have cities. The idea was not entirely new. In San Francisco the Fort Mason Army base had been closed down and a centre for community groups had been set up in the old buildings. It was highly successful. Tony went across to San Francisco to check it out and came back inspired about what might happen in Auckland. 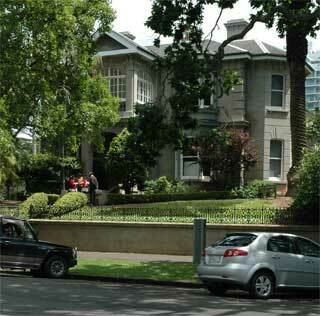 The Auckland City Council proposed demolishing what later became known as the Merchant Houses to extend Albert Park through to Princes Street. If the houses were to be demolished we argued that they had no value and therefore could be retained and leased at peppercorn rentals to community groups and professional bodies. Against all odds the idea gained support. All the fences were removed so that Albert Park could be visually connected through to Princes Street. People could easily walk through the surroundings so that the houses became buildings in the Park rather than barriers between the Park and Princes Street. One house which was out of line with the others was demolished, and a fountain introduced. The old stables became the George Fraser Gallery with a flat above for a writer's residency. 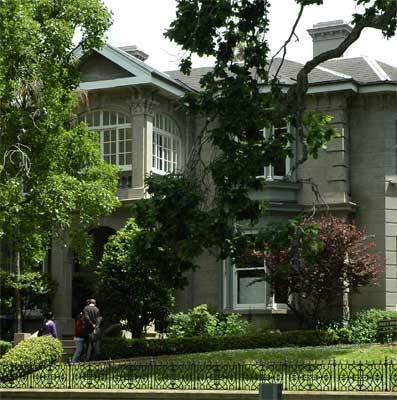 At last the Auckland Branch of the Institute of Architects had premises with the charm and urban presence of Tusculum in Sydney. It was a win-win situation. The heritage of the city was being protected by the architects so that they did not need to talk about what ought to be done. The reality of what had been done was there for all to see. Pembridge became the built form symbol of all the values held dear by architects. Pembridge was within easy walking distance of the great majority of Auckland architectural practices, so that no parking was needed. Walking became a way of life, and no CO2 emissions resulted from architects leading a full professional life. Students and architects could once again mingle as easily as they had many years before when the AAA rooms were in the Wynyard Tavern. When such a brilliant result had been achieved it seemed that architects could turn their attention to other urban issues. It can be easier however to have a revolution than to keep a revolution fresh. The idealism of those who achieve great things is not always carried through to another generation. Stories need to be constantly retold if they are to be kept alive. Envy and greed need to be kept at bay if they are not to sap the life blood of existence - and cities too. It was obvious to all that the best part of town had been given over to the poorest groups. It was a time when the egalitarian idealism of New Zealand was being destroyed by commerce. The serpent whispered in the ear of those to whom everything had been given. If only you could move to Parnell or Kingsland then all this could be yours. Over time the community groups sold their birthright for a mess of potage, and all that had been gained was lost. Aunty LIL began moving into the Merchant Houses. A new generation of architects grew up who had no sensitivity to urban design and no understanding of their heritage. Just as people sell off the world which has been freely given to them the architects sold off what others had achieved for them. Amanda Reynolds as Branch Chairperson and her committee made the worst urban design decision ever made in Auckland. They gave up what they could never regain and moved the premises of the Institute of Architects out to D-72, a wretched, soulless, sad, placeless building where the Institute had a burger-bar for a public facade and a cart dock for an entry. They had gone from elegance and the highest of standards to the depths of architectural hell in a single move. The architects had shown that they really supported built environment mediocrity. The credibility of architects as urban designers was destroyed in a single move. If it was just a story all this would be a wonderful Garden of Eden allegory. When it was a reality perhaps there is at least a lesson to learn. Celebrate life and recognise the wonderful world which has been freely given to us. It is the built environment which is destroying the planet, and architects must carry the blame. We have inherited a Pembridge and we risk passing on a D-72. The first move in combating climate change could be to remember Pembridge and all those who worked to make it possible.